Planning a SCR dive takes some calculations and is normally done with pen, paper and a calculator. In order to simplify the process you can install a small program on your mobile phone. The article deascribes how to install and use the program. Before you read this article you should read the article called "How to plan a rebreather dive". 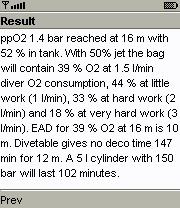 When you read the article "Plan a SCR dive" you probably thought that there must be a simpler way to plan a rebreather dive. There are many different ways to simplify the calculations like Microsoft Excel spreadsheets, dedicated PC programs and other solutions. This article describes a new type of program that can help you plan your rebreather dive. What makes this program different from the other alternatives is that it runs on any modern mobile phone. The reason to use a program for a mobile phone is that many times when you go diving you bring your mobile phone but you won't bother to bring your laptop. wap browser to the address http://tacticaldiving.com/dolphin.jad.php and the software installation will start on your phone. Download the software to your computer and transfer it to your phone using the infrared port or bluetooth. Start by downloading the JAR file to your computer. Activate the infrared port on your phone. Send over the file. The simplest way to do this is usually to right click the jar file and choose the option "Send To". The JAR file will most likely arrive as a message and then you just follow the installation instructions on your phone. 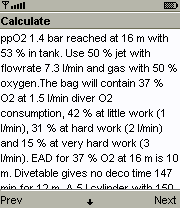 The first step for any semi closed rebreather dive is to decide how deep the dive will be since that will affect how much oxygen that can be allowed in the nitrox. 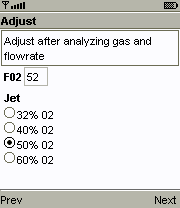 In the first step you can also input the size and pressure of your cylinder in order to calculate for how long the gas will last on your dive. 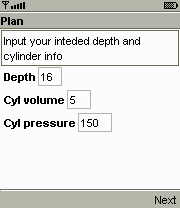 Based on your depth and cylinder information a recommended diveplan is presented. Pay attention to the ammount of oxygen you will have in the breathing bag and make sure it is at least 20% at the intended rate of work. After you have a suggested diveplan you may want to adjust it. For instance your oxygen percentage may be different from what you intended to fill, you might want to choose a richer mix or if you are planning to do hard work, choose a jet for a lower oxygen percentage. You can now insert your adjustments. Finally you get the result with your adjustmenst taken into account. Make sure the oxygen level in the breathing bag is at least 20% for your intended activity and note the cyliner duration and no decompression limit. If you know how to program using the Java language it is very easy to modify the program to suit your needs. Just download the source code and rebuild it with the Java Wireless Toolkit.